The broadcast network evening newscasts on Wednesday provided prominent coverage of the “Tea Party” rallies across the nation with time for the views of participants, but they tried to discredit the protests as a front for “corporate interests” or a “fistful of rightward leaning Web sites” -- a concern for motives and hidden agendas the same programs lacked when championing the 2006 pro-illegal immigrant marches. All three also cited polls to undermine the premise the public shares the concerns on taxes and spending espoused by the “tea party” protesters. The “tea parties” were about both taxes and spending and a USA Today/Gallup poll, highlighted on the front page of Wednesday's newspaper, found that while 52 percent approve of expanding government spending at least in the short term, “by 3-to-1, those surveyed say government's expansion should be cut back when the economic crisis is over.” Indeed, 44 percent disapprove of the expanded spending while only 13 percent favor making the expansion permanent. And a solid majority of 55 percent think President Obama's plans call for “too much” government spending. ABC's Elizabeth Vargas touted how "altogether, close to a million people took to the streets in more than 30 cities. And that number could still rise. It was the newest wave of protests against legislation that would increase the penalties for being in the U.S. illegally. Tonight, we have reports from around the country," including a piece on a "man in San Antonio, Texas, who broke decades of tradition" -- for 29 years never missing a day of work -- "to make his own statement." 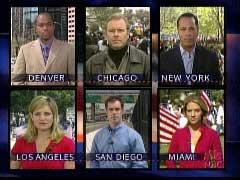 Over on the NBC Nightly News, which put six reporters on the story, Brian Williams heralded how "we've been covering a major story unfolding all day," showcasing video of "solid people for blocks." Williams concluded that "the protests worked in many cases. Stores closed as workers headed out the door, and live television covered it all, all day long. We have comprehensive coverage tonight from coast to coast..."
CHARLES GIBSON: And across the country today, thousands of people protested over the tax system, demonstrating against what they called “big government spending.” These self-styled “tea parties” were aimed squarely at President Obama and the Democratic leaders in Congress, and aimed at garnering media attention as well. Here’s Dan Harris. DAN HARRIS: They sang the national anthem in Fayetteville, North Carolina, marched through the streets in Eustis, Florida, and wore colonial outfits on the Boston Common, not far from the original tea party. UNIDENTIFIED WOMAN #1: We’re going to lose our freedom. It’s really absolutely tragic. HARRIS: They gathered at the Alamo in San Antonio, Texas; on the state house steps in Des Moines, Iowa; and in a town square in Cincinnati. UNIDENTIFIED WOMAN #2: We are spending way too much money, and we’re making our poor grandchildren pay for bills that are being accumulated now. HARRIS: Cheered on by Fox News and talk radio, the hundreds of tea parties today were designed to protest the bailouts, the stimulus plan, and President Obama’s budget. UNIDENTIFIED MAN: This is totally grassroots, got on the Internet, sent a couple of emails. HARRIS: But critics on the left say this is not a real grassroots phenomenon at all, that it’s actually largely orchestrated by people fronting for corporate interests – people like the politician-turned-lobbyist, Richard Armey. RICHARD ARMEY, FORMER HOUSE MAJORITY LEADER: Most of the people that are saying that are people whose politics I disagree with, and I’d just as soon have them continue to believe that. Don’t ever underestimate your opposition. This is real. HARRIS: While the Boston Tea Party in 1773 was about taxation without representation, critics point out that today’s protesters did get to vote – they just lost. What’s more, polls show most Americans don’t feel overtaxed. Tea party organizers say that will soon change, and that what we’re seeing today is the rebel yell that signals a conservative movement rediscovering its voice. 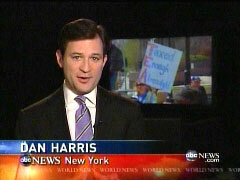 Dan Harris, ABC News, New York. GIBSON: Late today, the President and First Lady released their 2008 tax return. They had an adjusted gross income of more than $2.6 million. The President’s books do bring in a lot of royalties. They paid $855,000 in federal taxes, and the Obamas donated $172,000 – about 6.5 percent of their income – to various charities. MAGGIE RODRIGUEZ: Good evening. Katie is off tonight. It is perhaps the most dreaded day on the American calendar. Just say April 15 and people shudder. No one likes to pay taxes, especially not in this economy. This year, 141 million of us are expected to file, but the recession and unemployment could mean a sharp rise in delinquencies. Each of us will spend, on average, more than 26 hours to complete the federal return alone. And 60 percent will say, “too complicated,” and pay an accountant to do it. President Obama today vowed to simplify the tax code. BARACK OBAMA: It’s going to take time to undo the damage of years of carve-outs and loopholes, but I want every American to know that we will rewrite the tax codes that will put your interests over any special interests. RODRIGUEZ: But those words were of little comfort to thousands of Americans who held protests all over the country. Modern-day Boston Tea Parties, like the one happening right now in Arlington, Texas. Dean Reynolds tells us these people are angry about an increase in government spending, and the increased taxes they fear will follow. UNIDENTIFIED MALE PROTESTER #1, DRESSED AS UNCLE SAM: We’re mad as hell, and we’re not gonna take it anymore! DEAN REYNOLDS: They came to vent their outrage in big gatherings and small groups over what they see as runaway government spending, and the tax hikes they suspect are right around the corner. UNIDENTIFIED MALE PROTESTER #2: You’re no longer a citizen. You’re just a source of income. REYNOLDS: Big spending, bank bailouts or back taxes owed by Cabinet secretaries, the anger stretched from Boston to San Diego. UNIDENTIFIED MALE PROTESTER #3, CHANTING: Hey, hey, ho, ho, the Federal Reserve has got to go! REYNOLDS: The Tax Day Tea Party organizers said 750 rallies were being held nationwide – a counterweight to the argument that there is no choice but to kick start the economy with an infusion of spending. UNIDENTIFIED WOMAN ON STAGE: Stop saddling our children with unnecessary debt. REYNOLDS: National organizer Eric Odom was at the Chicago rally and predicted more to come. ERIC ODOM: The spending is out of control. Not just this administration but also the previous administration and its gotta stop. GLENN BECK: Everything is big in Texas. REYNOLDS: And tax day brought a worrisome phenomenon that could add fuel to the protests: A sharp hike reported in the number of taxpayers who, for the first time in their lives, are late or unable to pay up. RICHARD BOGG: We have found – this year in particular – almost a threefold increase in the rookie delinquent taxpayer. REYNOLDS: But it’s important to keep in mind that fresh polling indicates there is not all that much passion about high taxes in the country at large right now. 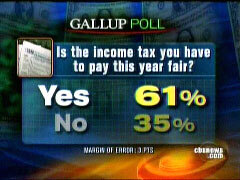 Gallup this week found 61 percent of Americans see their federal income taxes as fair. Americans, it said, view their taxes as positively as they have in the last 60 years. But that could change soon. MATT MILLER, CENTER FOR AMERICAN PROGRESS: The idea that you can resist tax increases forever, it just doesn’t work anymore. REYNOLDS: Just try telling that to the demonstrators in the streets today. Dean Reynolds, CBS News, Chicago. RODRIGUEZ: In case you’re wondering, no, he is not exempt. The President and Mrs. Obama released their federal tax returns today. They reported gross income of $2.7 million, most of that profits from Mr. Obama’s books. They paid $855,000 in federal tax, and deducted charitable contributions totaling $172,000. BRIAN WILLIAMS: And good evening on this Wednesday, April 15. This is the day working Americans eventually learn to dread, the day when taxes are due. And this year, it comes right as a debate is humming to life over how much more some should pay to subsidize all the various new uses of government money, our own taxpayer money, these days. While the President sent a message of his own on taxes today, this was also a day of protests around the country, organized on the Internet and by some cable TV personalities to allow taxpayers to vent about how their money is spent. 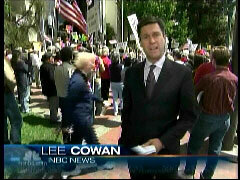 We have two reports to start us off tonight, beginning with NBC’s Lee Cowan in Los Angeles. Lee, good evening. UNIDENTIFIED FEMALE PROTESTER #1: We’re angry, and we’re very frustrated because, you know, we feel helpless. UNIDENTIFIED FEMALE PROTESTER #2: Washington, pay attention. The people of America are speaking, and you better listen. UNIDENTIFIED FEMALE PROTESTER #3: No more taxes! No more taxes! 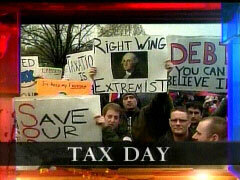 COWAN: Organizers insist today’s “tea parties” were organic uprisings of like-minded taxpayers from both parties. UNIDENTIFIED MALE PROTESTER: I’m not laying the blame on just one administration. COWAN: But some observers suggest not all of it was as home-grown as it may seem. CHUCK TODD, NBC NEWS POLITICAL DIRECTOR: A lot of the sentiment is about organizing anti-Obama rallies, getting conservatives excited about the conservative movement again. COWAN: Although today’s organizers called this national day of protest a success, polls still show that a slim majority of Americans actually approve of the bailout plan. What they disagree with is where the money should go. WOMAN: Stop taxing us and stop making our children and grandchildren pay for your mistakes. COWAN: One mistake of the protest, though today, throwing a box of tea over the White House fence. The Secret Service had to send in a robot to make sure it was nothing more. Now, there are several more protests planned for tonight, dinnertime demonstrations that organizers hope may bring even bigger crowds.